Renovated, re-opened recently and designed with a modern architecture taking inspiration from the Colonial style, the Rose Suite Hotel is an oasis of comfort which is spread by its first rate services and equipment suitable for unforgettable holidays. Its rooms are enveloped by an atmosphere of elegance and sophistication, created by the skilful combination of building materials and the attention to smallest details. 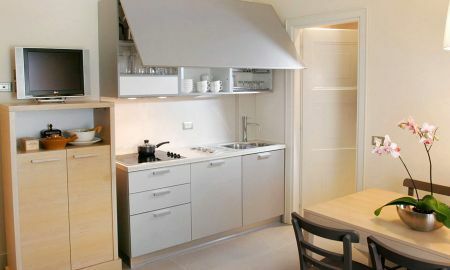 The hotel suites come with a nice kitchenette, a chic living room and a fully furnished kitchen. All these premises have Wi-Fi connection 24/7. Enjoy a wide selection of cocktails and fresh drinks in the Rose Suite Hotel’s American Bar and do not forget to taste authentic Italian wines. Do not miss the chance to appreciate the quiet hotel atmosphere by choosing an interesting book from the library in the hall, next to the fireplace or refresh your body in the stunning swimming pool. The Aquadirose wellness centre awaits you with relaxing and reinvigorating body massages, sauna, salt room and steam bath. The Rose Suite Hotel is located just a 2 minutes stroll from the shopping district of Marina Centro, 10 minutes Park Fiabilandia. 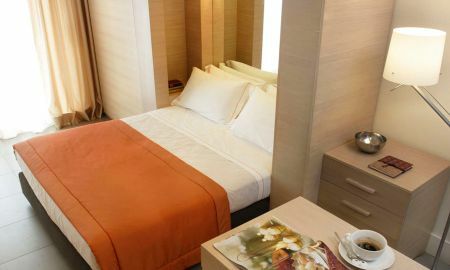 The Rimini Federico Fellini Airport is 3 km from the hotel. Please note that the wellness area is not available for children younger than 16 years old and during the winter it's heated and opened only to the Spa guests from 17:00 until 21:30. On Saturdays, Sundays and public holidays it is open from 09:00 to 21:00.